Dan Sullivan, the Republican candidate for U.S. Senate in Alaska, leaves the voting booth in Anchorage after marking his ballot in Alaska’s GOP primary election in August. Since we launched our Senate forecast, one thing hasn’t changed: Republicans have been favorites to win a majority. That’s despite some craziness in Kansas and South Dakota, as well as Democrats remaining competitive in Georgia. A large part of this consistent Republican edge is due to increasing GOP chances in Alaska. Democratic Sen. Mark Begich has run what has been regarded as one of the better campaigns this cycle against Republican Dan Sullivan. But it’s hard to outrun gravity, and the gravity in Alaska pulls to the right. President Obama lost Alaska by 14 percentage points in 2012, and the 49th state hasn’t voted for a Democratic presidential candidate since 1964. 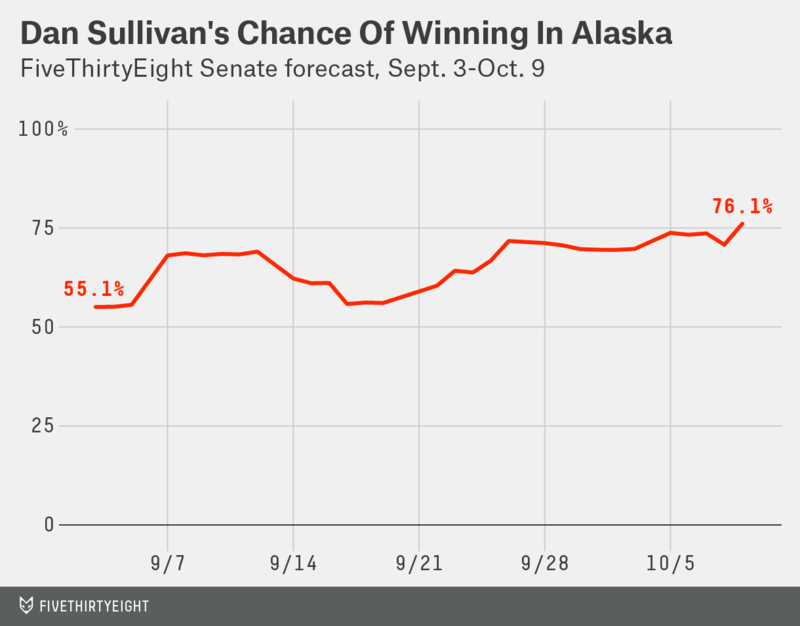 On Thursday, the FiveThirtyEight Senate forecast gave Sullivan a 76 percent chance of winning. That’s his best chance yet. Of course, this is Alaska, where there is always a fear the polls will be wrong. Polling in Alaska has been inaccurate compared with that in other states. And a lot of the polls through mid-September giving Sullivan the lead came from pollsters with nontraditional methodologies. Democrats have touted an unprecedented get-out-the-vote campaign, which could make a difference in a state with such a small population. And a couple of polls released by left-leaning pollsters in mid-September found Begich with a lead; you could have made the case they were seeing something the other pollsters were missing. On Thursday, though, CNN/Opinion Research Corp. released a survey giving Sullivan a 50 percent to 44 percent lead. That ties his largest lead since he won the Republican primary in August. More importantly, the poll was conducted with live interviewers, and it called cellphones. It’s a gold-standard poll. And it backs up the live-interview and cellphone polls conducted by local pollster Marc Hellenthal in mid-September and Fox News this week that put Sullivan up by 5 and 4 percentage points, respectively. Sullivan is winning. 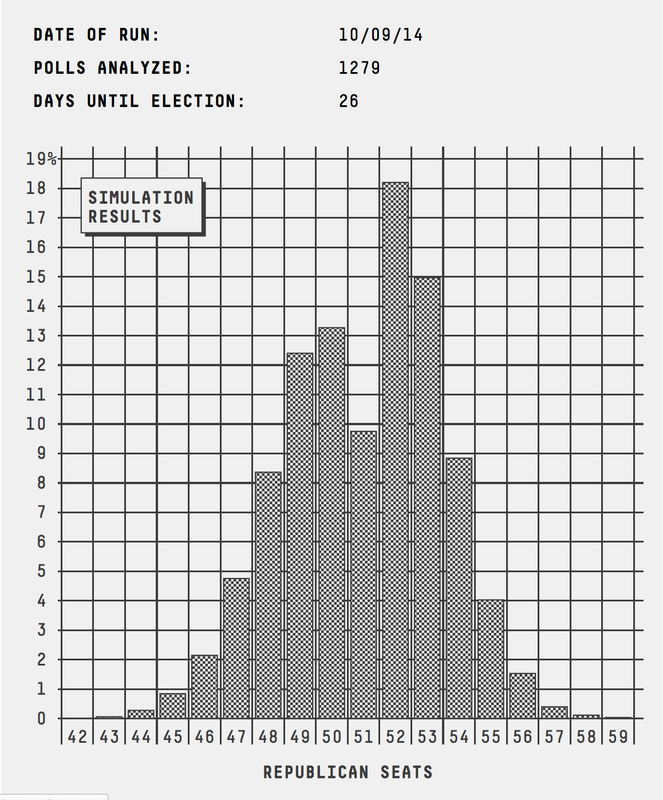 He has led across many pollsters with different technologies and sampling styles (i.e. non-probability, random digit dial and registration based sampling). So, how has Sullivan pulled ahead in a race that was close for most of the year? The most obvious answer: fundamentals. Alaska is a conservative state. Obama’s approval rating in Alaska is in the low-to-mid 30s. Begich was helped in 2008 because his opponent was a convicted felon. And even with a weak opponent, he won by only about 1 percentage point. The fundamentals were kept at bay earlier in the campaign because of a contentious Republican primary. But once Sullivan became the Republican torch-bearer, he was able to consolidate the conservative vote. Additionally, Republican spending on advertising has been equal to Democratic group spending in the past three weeks, according to Echelon Insights. That’s a reversal from earlier in the campaign. All those “great” Begich ads are now being matched by Sullivan’s. Alaska is not yet in Michigan territory, a state that’s trended out of the battleground column, but Begich needs something to happen in the campaign or a large polling error to pull it out.